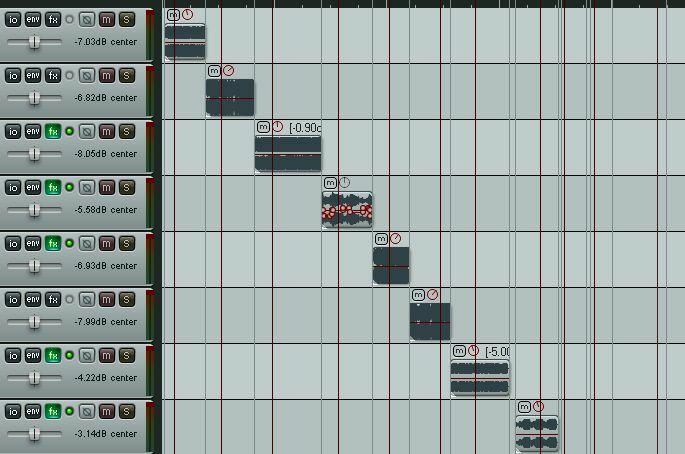 Does anyone have any tips on how to produce a dozen tracks or so to similar "loudness"? I'm keen to hear what different approaches you use. Obviously I can use my ears but it strikes me that running some kind of loudness meter might be useful too. I've got a couple here but don't really get what all the labels mean. For example I have a melda Loudness Analyser that gives values for Peak, True Peak, Momentary, Short Term, Integrated and Range. I also have a plug called RMS buddy that seems to be somewhat more self-explanatory. I figure I could also run a spectrum analyser on each track and get an average spectrum for each one. That might be a help in gauging whether some of them are heavier in the bass than others (etc). Or maybe none of this is really worthwhile? If you're interested I'm putting together electronic music - ten or twelve tracks written at different times, using quite different approaches and techniques. For starters you could check out Compyfox' public KVR links which got some good info regarding metering. This way I can skip to different tracks instantly and compare, make adjustments as needed so it sounds coherent. Last edited by No_Use on Wed Feb 25, 2015 3:33 am, edited 1 time in total. I'm using IK Multimedia meter's "perceived loudness" indication to get the tracks to the same ballpark, and then fine tune by ear. ...or you could do that by ear, like all the DJs do Still, that only works if you can mix the tracks in resonable way. I never use any analyzers etc., be it for loudness, equalization or whatever. I just close my eyes and listen, comparing it to a couple of other people's songs which I know are well done and thus serve as a reference. No_Use wrote: For starters you could check out Compyfox' public KVR links which got some good info regarding metering. Thanks for the forwarding - appreciated. In all seriousness though, if you can get a hold of a cheap EBU R-128/ITU-R BS.1770 meter, you can easily set up your session and then go from there. My recommendation is ToneBoosters EBU Compact (small and simple) or EBU Loudness (with histogram function and even more technical data). - one the playback is done, I take a look at each plugin instance to take note of the "Integrated" loudness (ILk) and "Short Term" loudness (SLk). You can now move your tracks to the positions you want to have, and if you hit play, the whole "stream" (so to speak) should have a similar loudness that only needs finetuning according to your ears. This can work with both ILk and SLk. Only that ILk uses a gate for noise bursts above -10LUFS and below -70LUFS. ILk is more aimed at a "broadcast" stream (or radio plays, Podcasts, etc), while I personally think that SLk is more suitable for music. You can now add your fairy dust and use a gain->limiter chain to push up your tracks to your specific desired loudness (i.e. -14LUFS, or back down to -16LUFS), and there you have your mastered record. What you basically did, was doing "manual loudness normalization"! If you happen to use Wavelab, it's even simpler to determine the track's current loudness, which can then be adjusted to get a more "evened out" average loudness stream. Use the Batch Function in Wavelab! - set the output module to "no output"
- go into Multipass Plugins and load the "Loudness Normalizer"
- set the analysis function to "short term loudness" and "exact digital peak"
- set up the output module to "subfolder of the source path"
Then you can proceed as mentioned earlier. There - loudness normalization in a nutshell. Mostly I do it by ear as well, and it helps a lot to also reference on other speakers or in another room once you think you have them all close. Generally that tends to show any tracks that are just a touch louder or quieter. If you do use a meter to help, don't go by RMS, try and find one that that supports the LUFS as mentioned above. Much more reliable and accurate for what you're trying to do. Ears all the way baby, only way to do it convincingly. For my radio show I use the Loudness tool in RX4 Advanced, you can "Loudness Normalize" I usually go to -16 LUFS ITU/EBU standard. Does an OK job, but for client material I would never do this, always by ear. It's not hard to listen to gtrack to track volume and adjust to suit, but why do so many people seem not to want to? If you do it automatically, you'll get the tracks that are supposed to be quieter at the same perceived loudness as the tracks that are supposed to be louder = not good. Yes - use your ears. If I'm mastering an album I will just keep listening, playing a few seconds from various sections of each track over and over until it all 'slots' into place - your ears will tell you when it all sounds 'right'. It's also worth noting that in the good 'ol days albums themselves would have a dynamic - there would be quieter tracks and louder songs on purpose so it's not always the case to just get every track at the absolute same perceptive loudness. Ditto, needle dropping through tracks seems to work better than playing the whole thing. Yes, your ears are still the most important weapon in this game. But you shouldn't underestimate your metering tools as well. They not only give you a general guide, but also show your your ultimate/final values. A combination of both is essential. And using the ITU-R BS.1770-x/EBU R-128 specs is a great helper these days. Fine adjustments are then really easy. Use your ears all the way ... metering, etc is very useful, but you should always go by what you hear (imho). Obviously you'll need decent monitors and a good listening environment too. When putting an album together I usually find the track that sounds closest to what I want for the entire album, and then adjust the other tracks to sound similar volume and eq wise.